So my long (long looooooong) spell of waiting is over, and not in the way I had hoped - though a number of people in a position to understand it all better than I have just about convinced me that this outcome will be the best one in the long run. I think. In any case, that's really all I'm going to say about it, with apologies for being mysterious. Overall I'm relieved to have the waiting be over, but I've got feelings to process and next steps to ponder. As I do so, I'm continuing to work on practicing meticulous mindfulness - it, along with regular strenous gym workouts, has become a key mechanism for dealing with the 'anger' phase of the process around this drawn-out decision (to say nothing of my feelings about current events in the wider world). As I refocus on life here in Canberra, autumn is getting underway. The first of the new season apples are showing up at the markets, so to celebrate earlier in the week I made a personal-sized version of Dinner with Julie's Apple Pie Scones - I still used a whole apple, but it was small, and I halved the scone dough. I got 3 good-sized scones out of it, and it significantly improved my week. Since baked goods can improve most people's week, I also asked Miss B what baked good she was in the mood for, and she requested Dark Side cookies - "like the kind they would have to lure you to the Dark Side?" 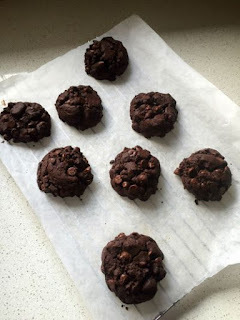 So I dug up this recipe from Nigella Express, and these super-chocolate bombs were just what the doctor ordered - or rather the frazzled new high schooler. Yes - did I mention that Miss B is now in high school?! To be fair, it starts in Year 7 in Canberra, but still. 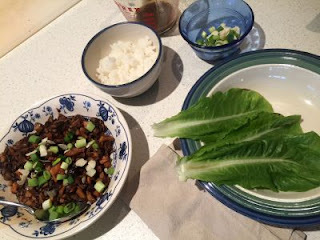 In other cooking experiments, I had a sudden hankering for san choy bow the other night, so I decided to whip some up. I didn't bother looking up a recipe, I just winged it (wung it?) with what I had on hand. My version consists of chopped onions and mushrooms (and a little smoked salmon too) sauteed with oil/ginger/garlic/chili, with a sauce of 2 parts soy to 1 part fish sauce/sugar/lemon juice/sesame oil/sriracha, topped with chopped scallion/spring onion and slivered almonds. Wrap in lettuce leaves and have some rice alongside if you're a carb fiend like me. Proper san choy bow recipe here (turns out I wasn't that far off!). After my weekly farmers' market run this morning, I did some prep cooking - restocking my personal pantry for the week. On the right you see my coldbrew coffed brewing. On the left, my copy of Genius Recipes open to the One-Ingredient Whole Grain Crackers, which I made with a rice-quinoa blend I'm trying to use up. 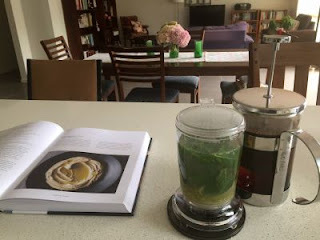 And in the middle, my re-gifted T2 tea infuser* brewing up a concoction of citrus zest and juice and mint and maple syrup to add a twist to my daily Green Tea Fizz. *Sidebar story: the friend who re-gifted this to me handed it over with the declaration that she couldn't be bothered to use it, but that she was sure I'd figure out something interesting to do with it. I decided to take that as a compliment and a challenge; it took me a few months, but - voila!